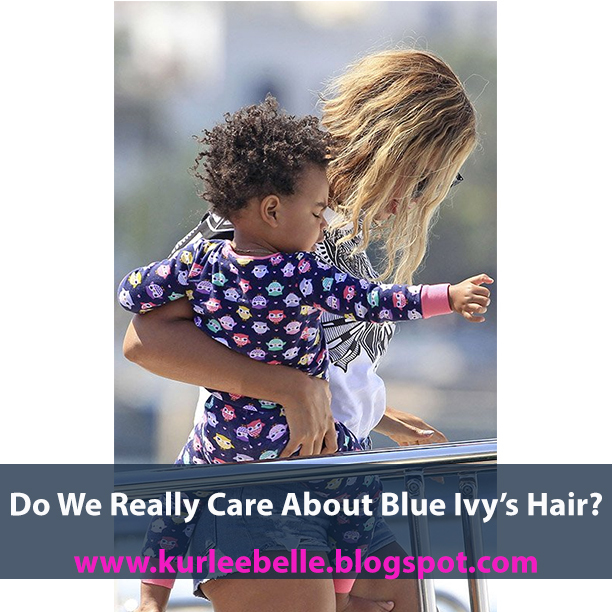 Kurlee Belle: Natural Hair | Blue Ivy's Hair: Do You Care? Beyonce and Jay Z have been jetting around since the end of the Mrs. Carter World Tour and Made in America. Their little bundle of joy, Blue Ivy, has been the center of attention and the paparazzi. From her funny facial expressions, Baby North and Blue's meme's to the most recent social media topic---Blue's Hair. Beyonce recently showed off a short pixie cut and it seemed to be all the rage on Instagram, Twitter and Facebook. Since then, Mrs. Carter has went back to weave heaven, flaunting a longer assymetrical bob. The attention however has shifted from Mama Bey's hair to little baby Blue. The adorable one year old has a tightly curled afro and not a care in the world but many are outraged about it's maintenance. Do We Really Care About Blue Ivy's Hair?